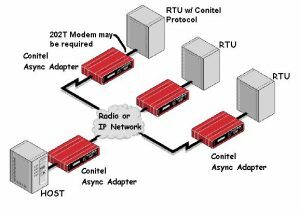 allows migration of Conitel SCADA from the ever more expensive and hard to order analog phone lines to digital asynchronous data circuits, including DDS, radio links, and Ethernet/IP networks using the DCB EtherPath or EtherPoll. The Conitel ASYNC ADAPTER is easy to set up. A 9600 bps RS232 management port can be connected to a dumb terminal or a PC running a terminal program. Menus are in clear, concise English. synchronize the receiver. This method is similar to the start bit of async serial byte oriented data. The Conitel protocol however sends the remaining bits of the message with no further synchronization bits.